AC PWM drives, increasingly popular on marine vessels of numerous types and classes, provides energy saving and/or ease of control. Typical duties including fans, pumps, thrusters, winches, hoists, compressors and cranes. Common dc bus drive systems for multiple low voltage VFDs (variable frequency drives) have gained in popularity over the last 10 years. They are more compact and require less cabinet space than multiple, standalone VFDs. Efficiency is enhanced due to the common dc bus (or DC ring main). Their use is applicable to many applications and power ranges. As can be seen in Fig. 1, a typical stand-alone VFD consists of a rectifier, DC bus (capacitor storage unit), an IGBT inverter. With a common DC bus system or DC ring main, a common rectifier supplies rectified DC voltage into the DC bus. Fig.1 - Difference between common AC bus and common DC bus VFD concepts. The IGBT inverters then invert the DC voltage into AC of variable voltage and frequency for the motor. Phase shifting transformers, active filters, series passive filters and AFE (active front end) rectifiers are used to reduce the main side harmonic currents but none of these solutions are perfect. In addition to design flexibility, common DC bus drive systems offer higher levels of efficiency. Power sharing on the DC bus is possible with applications which have multiple IGBT inverters that simultaneously motor and generate power. The drive system is more efficient as less power is drawn from the rectifier when the generating IGBT inverters are injecting power to the common DC bus to be used by the motoring units, which consume power. A leading electrical manufacturer now offers low voltage DC power (1000VDC) where the DC derived from rectifiers integral to the AC generators. On these vessels the sinusoidal AC power has to be synthesised and supplied by converters. The synthesised AC voltage is rarely sinusoidal and due to the PWM switching, EMC issues, including common mode voltage can be problematic. The challenge with conventional rectifier-based DC power systems is breaking the DC current during fault or load condition. This requires expensive DC breakers. Resonant Link AC-DC active transformers offers significant benefits for medium to high power common DC bus and DC ring main systems for LV and MV VFDs. A typical block diagram of AC-DC active transformer for LV VFD system is illustrated in Fig. 2. Fig. 2 -Multi-module, Resonant Link active transformer system for common DC bus, multiple VFD power supply application. Built-on redundancy and >3MW/m3 . Resonant Link active transformers have very high-power density (5.5MW per cu.m.) compared to conventional diode or SCR based traditional rectifiers. This is considerably enhanced due to the lack of conventional transformers which require significant floor space. Virtual elimination of harmonics at the input with a total harmonic current distortion THDi) of <2%. Sinusoidal voltages and currents at the input. No phase shift transformers, passive filters or any type of harmonic mitigation are required, again saving significant space and weight. High efficiency (>98%). 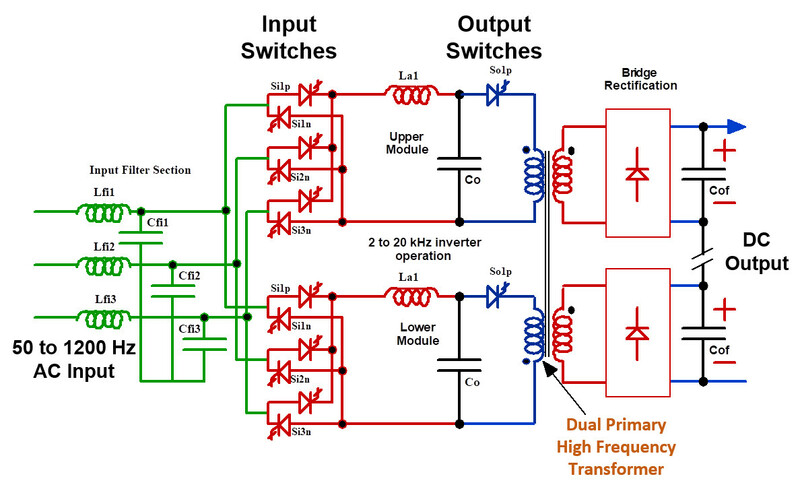 Soft switching enables rectification and where applicable, inversion, up to 20kHz switching with resultant high efficiency at LV and MV. Direct connection to MV if required. Conventional transformers for voltage transformation are not required. Instead high frequency, nanocrystalline transformers are utilised and mounted into the active transformer enclosure. A typical 1MVA nanocrystalline transformer weighs less than 50kg and is mounted inside the enclosure. As can be seen above, Resonant Link AC-DC active transformers comprise multiple, parallel power modules for redundancy and have the capability of hot swapping module in the event of a failure. Fault immune operation via natural fault current limiting and zero current turn off. No expensive AC line breakers and DC circuit breakers. ALL protection is integral in the active transformers so only electrical isolators are required. Fig. 3 - Schematic of Resonant Link AC-DC active transformer for DC bus applications. 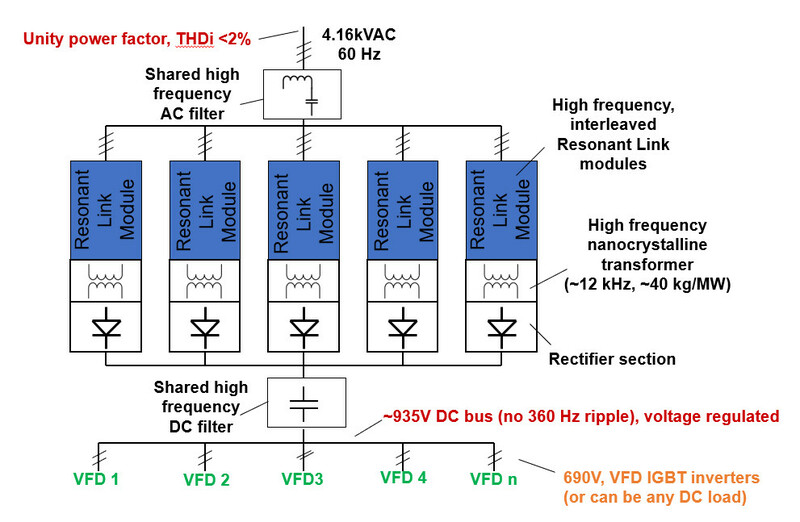 Note: The benefits of Resonant Link DC power systems can be utilised for ANY application where the multiple VFDs or other DC loads have to be supplied. This may include many industrial applications including iron and steel, electro-plating and petro-chemicals.